Ralph George Houk (/ˈhaʊk/; August 9, 1919 – July 21, 2010), nicknamed The Major, was an American catcher, coach, manager, and front office executive in Major League Baseball. He is best known as the successor of Casey Stengel as manager of the New York Yankees from 1961–63, when his teams won three consecutive American League pennants and the 1961 and 1962 World Series championships. A native of Lawrence, Kansas, Houk was a catcher working his way through the Yankees' farm system when the U.S. entered World War II. He enlisted in the armed forces, became an Army Ranger, and rose to Major (the source of his Yankee nickname). He was a combat veteran of Bastogne and the Battle of the Bulge, and was awarded the Bronze Star, Purple Heart, and the Silver Star with oak leaf clusters. Returning to baseball after the war, Houk eventually reached the Major Leagues, serving as the Yankees' second- and third-string catcher behind Yogi Berra. A right-handed hitter listed as 5 feet 11 inches (1.80 m) tall and 193 pounds (88 kg), Houk played in only 91 games over eight seasons (1947–54), finishing with a batting average of .272. Although the Yankees participated in six World Series during that period, Houk had only two Series at bats (one in 1947, the other in 1952), batting .500. During his last five years as a big-league player (1950–54), Houk played in only 31 regular-season games, made 30 total plate appearances, and caught 83 innings. But by 1953 he had transitioned to becoming the Yankees' full-time bullpen coach, effectively beginning his managerial apprenticeship. In 1955 he was named manager of the Yanks' Triple-A affiliate, the Denver Bears of the American Association. Following three highly successful seasons at Denver, culminating with the 1957 league playoff and Junior World Series championships, Houk returned to the Bronx as Stengel's first-base coach from 1958–60. From late May through early June 1960, Houk served as acting manager of the Yanks for 13 games while Stengel, 70, was sidelined by illness. (The team won 7 and lost 6.) Then, after the Yanks lost the 1960 World Series to the Pittsburgh Pirates—and with Houk one of the hottest managerial candidates in baseball—the Yankees "discharged" Stengel (to use Stengel's own words) and promoted Houk. Houk was known as a "player's manager"—albeit one with a quick temper. Future Los Angeles Dodgers manager Tommy Lasorda briefly played for Houk at Denver and called Houk the best handler of men he ever played for, and modeled his managerial style on him. The Kansas Sports Hall of Fame, of which Houk is a member, describes Houk as "rough, blunt and decisive" and his tantrums in arguments with umpires earned him 45 ejections as a manager in the majors. Houk is tied with Billy Martin for fourteenth place on baseball's "most ejected" list. The early 1960s Yankees responded to Houk's leadership; the 1961 team led by Roger Maris (61 home runs), Mickey Mantle (54 homers) and Whitey Ford (25 victories) won 109 games and beat the Cincinnati Reds in five games in the World Series. His 1962 club won 96 games, and were victorious over the San Francisco Giants in seven games in the Fall Classic. In 1963, the Yanks won 104 games and rolled to the pennant, but were swept in four games by the Dodgers in the Series. Houk moved into the Yankees' front office as general manager on October 23, 1963, replacing Roy Hamey, and Berra, at the end of his playing career, became the Yanks' new manager. Yogi would win the 1964 pennant after a summer-long struggle with the Baltimore Orioles and Chicago White Sox, but Houk and the Yankee ownership quickly became disenchanted with Berra's work and in late August they made up their mind to fire him regardless of how the season turned out. After the Yankees' seven-game loss to the St. Louis Cardinals in the 1964 World Series, Houk sacked Berra. Later, Houk said that the Yankee brain trust had concluded Berra wasn't ready to be a manager, though he didn't elaborate on the reasoning. To succeed Berra, he then hired Johnny Keane, who had just resigned as manager of the champion Cardinals. Houk had admired Keane as a competitor in the American Association from almost a decade before and, according to author David Halberstam, the Yankees had made overtures to Keane during the 1964 regular season about becoming their manager for 1965. But the great postwar Yankee dynasty was aged and crumbling, the farm system had seriously deteriorated, and the Kansas City Athletics were no longer a reliable source for Major League talent. Keane, a longtime minor league manager, was better suited by temperament for managing young players than established and aging superstars, and his hiring was a failure. The team fell to sixth in 1965—their first losing record since 1925, and only their second since 1918. When they won only four of the first 20 games of 1966, Houk fired Keane on May 7 and named himself manager, assuming that job for the second time. Houk (eventually succeeded as general manager by Lee MacPhail) thus began a second, and far less successful, term as Yankee manager, finishing the 1966 season. Their talent and farm system both depleted, the Yankees finished in last place for the first time since 1912. A long rebuilding process followed, including Bobby Richardson's retirement (Richardson's roommate, Tony Kubek, had retired because a bad back after the 1965 season) and the trading away of Maris, Clete Boyer and, during the 1967 season, Elston Howard. Houk would continue to manage the Yankees from 1967 until 1973. His best season was 1970, when the Yanks won 93 games, but finished 15 games behind the eventual World Series champion Baltimore Orioles. He worked for George Steinbrenner for one season, in 1973, and was the Bombers' manager during their final game in 1973 at the "original" Yankee Stadium prior to its closure for two years for renovation. After the final game of 1973, he resigned as manager. While Steinbrenner's commanding style has led some to think the new owner influenced Houk's departure, he told Bill Madden of the New York Daily News it was the constant booing of Yankee fans that pushed him. Houk even said that Steinbrenner insisted he'd get some new players to restore the team's greatness. "And he did, bringing in Catfish and Reggie, " Houk told Madden in the sportswriter's book Pride of October. "That'll make you good in a hurry!" Apart from a brief stint with the Detroit Tigers' Class B affiliate in Augusta, Georgia; he had spent the first 35 years of his adult life on the Yankees' payroll. 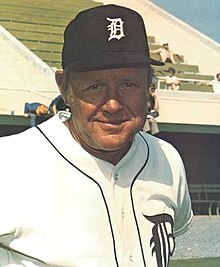 On October 11, 1973—less than two weeks after Houk left the Yankee organization—he became the manager of the rebuilding Detroit Tigers. The veteran club (its 1973 roster averaged 31.8 years of age) had won the AL East in 1972 under Billy Martin, but was in need of replacing its longtime stars, including Hall of Famer Al Kaline, with younger talent. The low point came in 1975, when Houk's team lost 102 games, but the 1976 Tigers improved their record by 14 games behind the heroics of rookie pitcher Mark Fidrych, who won 19 games while becoming a national sensation. By 1978, Houk had restored Detroit to respectability and its first winning record since 1973, bringing to the team future stars of the Sparky Anderson Tigers such as Lou Whitaker, Alan Trammell and Jack Morris. After an 86–76 season in 1978, and with the roster's average age a youthful 26.3, Houk retired. Houk's name had been linked by the media with the Boston Red Sox' managerial job since his days as a Yankees' coach. After two years of retirement, in the autumn of 1980, Houk, now 61, was ready to get back into baseball. In late October, when the Red Sox called about their opening (they had fired Don Zimmer), he jumped at the chance. Although not as daunting as his Detroit assignment, Houk faced another rebuilding job: the powerful Boston team of the 1970s was about to lose marquee players such as Carlton Fisk and Fred Lynn and needed to retool its roster. But Houk rose to the challenge, and in four seasons produced three over-.500 teams. On his watch, Boston broke in young players Wade Boggs, Roger Clemens, Bruce Hurst and Marty Barrett. When Houk retired from managing permanently in October 1984, just after his 65th birthday, he bequeathed the core of another pennant winning ballclub (in this case, the 1986 Red Sox) to his successor, John McNamara. His final record, over 20 years with the Yankees (1961–63, 1966–73), Tigers (1974–78) and Red Sox (1981–84) was 1,619 wins and 1,531 losses (.514), plus eight wins and eight losses in the World Series. After his first three championship seasons, he never appeared in the postseason. Houk served with the Minnesota Twins as a special assistant to general manager Andy MacPhail, Lee's son, from 1987–89 before retiring from the game for good. He thus enjoyed one additional world championship season, when the Twins defeated the Cardinals in the 1987 World Series. Colorful opinions about Houk can be found in Jim Bouton's classic 1970 memoir, Ball Four. Houk was Bouton's first big league manager and sparred with him over contracts when Houk was the Yankees' GM. Houk was portrayed by Bruce McGill in the 2001 film 61*. He died on July 21, 2010 in Winter Haven, Florida, just nineteen days before he would have turned 91. At age 90 he was, at the time, the oldest living manager of a World Series-winning, pennant-winning or post-season team. He was survived by a daughter, Donna; a son, Robert; four grandchildren and 10 great-grandchildren. On July 22 the Yankees announced players and coaches would wear a black armband in Houk's memory on the left sleeve of their home and away uniforms for the remainder of the 2010 season. ^ Anderson, Dave (July 25, 2010). "Lucky to Be Yankee and Lucky to Be Alive". New York Times. ^ Goldstein, Richard (July 22, 2010). "Ralph Houk, Yankees Manager, Dies at 90". New York Times. ^ Lasorda, Tom; Plaschke, Bill (2007). I Live for This: Baseball's Last True Believer. Boston and New York: Houghton Mifflin Co. pp. 84–85. ^ Stark, Jayson (June 14, 2007). "Cox's favorite tune: Take me out of the ballgame!". ESPN.com. ^ a b "Ralph Houk (front office history)—Baseball America Executive Database". ^ Reichler, Joe (February 28, 1965). "Notes: His biggest mistake was Yogi, Houk says". The Tuscaloosa News. Associated Press. Retrieved July 14, 2014. ^ Halberstam, David (1994). October 1964. New York: Random House. ^ a b "Ralph Houk". Baseball Reference. Sports Reference LLC. Retrieved September 22, 2018. ^ Craig, Marc (July 22, 2010). "Yankees plan to honor late manager Ralph Houk". Newark Star-Ledger. Archived from the original on July 27, 2010. Retrieved 2010-07-23.